The Rock Solid Hot Shoe to 1/4″-20 Male Post Adapter has a threaded 1/4″-20 stud on the top and a cold flash shoe on the bottom. The Rock Solid Hot Shoe to 1/4″-20 Male Post Adapter has a threaded 1/4″-20 stud on the top, a cold flash shoe bottom, and a female 1/4″-20 underneath. This indispensable little adapter allows you to mount camera, video, and audio accessories that come with a 1/4″-20 socket directly to a camera, rig, or extension bar. 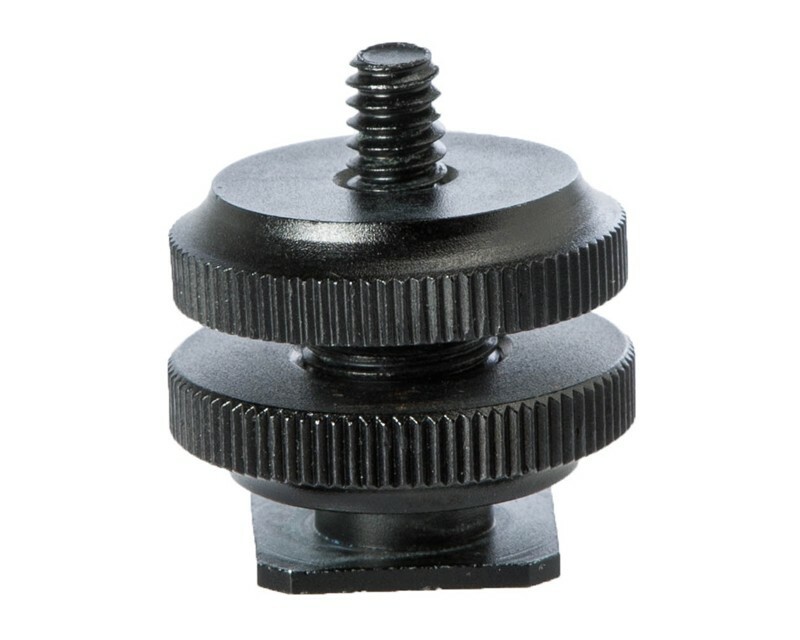 Included with the cold shoe adapter are 2 locking knurled thumb nuts assuring a tight connection to any accessory. All aluminum construction. Available in non-reflective black. Is the device you are looking to attach lacking a 1/4″-20 thread? Add a Mighty Mount.